Joseph Brant Ryckman, born September 7, 1871 in Hamilton, Ontario. He died in Windsor, Ontario on November 13, 1954. 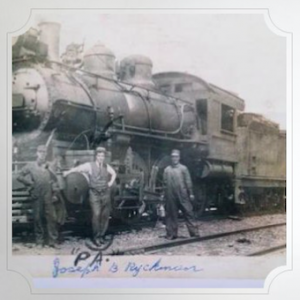 Joseph Ryckman entered the service of the Wabash Railway on December 31, 1900 and was promoted to conductor on September 17, 1907. He continued as a conductor on the Wabash Railway until the late 1940s. While he was a railway conductor he lived and worked out of St. Thomas for a time and also for most of the time out of Windsor. He retired to his home in Windsor. During his long and dedicated career on the Wabash Railway there are surely many stories to tell, but there is one incident that can be related based on newspaper information printed at the time. This incident occurred on July 31, 1939 at 5:55 a.m. on a foggy morning, when conductor Joe Ryckman and chief clerk George Winter were in the caboose of a stopped train at the east side of St. Thomas near where the Vitrified Company was located. At this time a Wabash freight train came barreling into their caboose and virtually demolished it. Luckily they jumped to safety at the last minute and were not hurt. The Engineer and Fireman of the Wabash freight also were luckily not hurt.